Isn't it annoying when your official slow and buggy Google Voice app is hit or miss when it comes to text messaging, too, not to mention the inability to work the MMS crowd? To right this unbearable wrong CyanogenMod's Koushik Dutta has come up with a way to send Google Voice messages utilizing any available for that app on your phone, including the default messaging one. Here's the feature, integrated in current (after July 1st) nightlies, in a nutshell: "The app will sync your existing Google Voice messages into your messaging store. New Google SMS will be received as if it were a normal SMS. 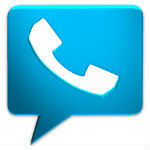 When you send a message out from your messaging app, it goes out via Google Voice." Goodie. Head over to the source for installation instructions.